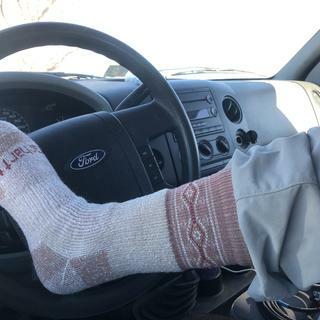 Make sure you always have enough socks for cold days on the job. These women's socks are made of a wool blend that keeps feet warm and wicks away sweat. These are great to wear outside with my muck boots and don't ride down at all. Also very warm. And love wearing them around the house too. Have at least one pair for every day of the week. Bought these for my sister for Christmas she loves them. Wonderful socks for being out in the woods getting firewood and doing chores around the homestead. So soft and comfortable, toasty warm and well fitting. Really love these socks. My feet are always cold and this cold weather doesn’t help. I had a hard time look for socks. But, finally found some that keep me warm and no more cold feet! Great length and thickness. Use them for work out in Colorado where winters get very cold but these socks keep my feet nice and warm. Great thick socks that go about half way up the calf. Love the length and are very comfy. A little too thick for my tastes and the pattern isn't as pretty as I'd hoped. We appreciate your input. Please feel free to contact Customer Service at 1 800 833 3118 if we can further assist in any way. Sock itself is great but the black had one sock in the pack that was the size smaller than the rest of the pack. When I contacted customer service they told me there was nothing they could do. Very comfortable, not itchy at all, feat purchase! Best Socks for cold NYS winters! I love these socks! They keep my feet nice and warm while working outdoors in muck boots all day. Just perfect! Super comfortable and worth the money, I'll be buying more! I love these socks!! I was worried that my feet would get hot by the end of the day but they didn't! Well worth every penny! way to small around the calves. Thank you for your input. We're sorry to hear this and have shared your input with Product Design. Please feel free to contact Customer Service at 1 800 833 3118 if we can be of any assistance. Just as envisioned. Confirtable and well made. My wife loves her warm socks! I wear a size 10 and these socks fit great. For winter boots I wear Bogs and Mucks, so purposely buy them a little larger so I can double up my socks. These Carhartt socks are thick enough so I don't have to wear two pair. Warm and comfy, I love them! They are a lot thicker than they looked online. I can't wear them. They are too bulky and I can't get my feet in my shoes or boots. Thank you for your feedback. Your comments will be shared with Product Design. Please feel free to contact Customer Service at 1 800 833 3118 if we can be of any assistance. Do they come in grey and pink? Or just pink? BEST ANSWER: Two of the pairs are pink and two are grey. I love mine, very warm and comfy! What are the sizes of shoes for your sock sizes? BEST ANSWER: Size Small (Shoe Size 4-9), Medium (Shoe Size 5 1/2 - 11 1/2), Large (Shoe Size 9-12). What is the percentage of wool and are they at all itchy? BEST ANSWER: This style will be 44% Polyester/37% Acrylic/9% Nylon/8% Wool/2% Spandex. I’m not sure what the percentage of wool is but they are not itchy at all and are very comfortable. I love them!!! No not at all! They are actually really soft, super warm. After I bought these I ended up buying 2 more packs! I’m not certain about the wool percentage, but they are extremely comfortable, not itchy at all. Not itchy at all! Wear them all winter with my snow boots. Not sure on the blend #. Not sure on percent. Very comfortable, not itchy at all, feat purchase! Don’t remember percent of wool but they are not itchy at all. I have them and they are not itchy. Can they be washed and dried in machines? How much foot padding do these socks have? Light, Medium, heavy? BEST ANSWER: These socks are exactly what I was looking for. They have great padding and provide a warmth that is just right for those cold days. My feet are well rested after a long day’s work. Medium padding, just the right amount to offer cushioning without being ill fitting in shoes. DO they have these packs for men too?